He wanted a university experience that’s not just about what you learn in the classroom, says business alumnus Montana Northcroft. Take every opportunity AUT throws at you, Montana says. Going on a student exchange to the University of North Florida in Jacksonville was one of the highlights of Montana’s time at AUT. “Getting to experience an American university not only improved me as a student but also as an individual. It has given me life experiences that I would have never received without going outside of my comfort zone. Montana says he is grateful for receiving the Eric and Kathy Hertz Māori and Pacific USA Exchange Scholarship, which helped him fund his time in the US. After graduating at the end of 2018, Montana is now back in the USA, working as a marketing intern for Kettlebell Kitchen in New York City. He got the sought-after internship through the AUT Internz International Scholarship Programme. 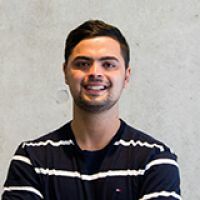 The AUT Internz programme makes it easy to transition from university to the workplace, and gain valuable international experience at the same time, says Montana.